Dr. Andrés García-Montero holds a degree in Biology from the University of Salamanca (1992) and obtained his PhD in 1997 at the University of Salamanca. 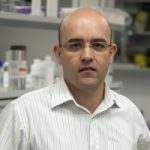 Currently, he is a researcher at the Cancer Research Institute of the USAL (12 years of experience –y.exp.-) and Technical Director of the BNADN (9 y.exp.). His main research activities are focused on biobanking and mastocytosis.